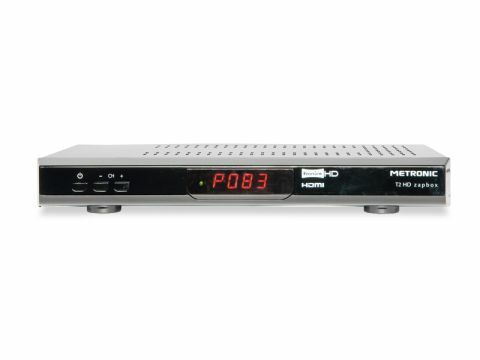 The Metronic T2 HD Zapbox is a rather rudimentary take on DVB-T2. No bigger than a tiny, no-frills Freeview HD box, it sports a bog-standard black shell with a central red LED display that's flanked by simple standby and channel up/down controls. On the rear is an Ethernet port for software upgrades next to a single Scart, aerial input and loopthrough, a HDMI and an optical digital audio output to take care of sound. The presence of a Scart (which can be set to RGB or composite) may seem redundant on an HD receiver, although it's the absence of common interface slots and USB ports that hamstring this box in terms of flexibility – the former puts ESPN off the menu (if that matters to you), the latter digital media playback. The lightweight remote, curved at both ends much like a Slingbox, is overlong but otherwise well designed. Buttons are laid out logically and well labelled, though we did experience some lag between issuing a command and the T2 HD responding. The main 'menu' and 'guide' buttons both take more than a second to bring up the interface, which is nicely styled in purple, lilac and red, but not quite hi-res enough for our tastes. A choice is presented between a simple channel list and a dedicated EPG, although it would be easier to have buttons on the remote to call up each separately. The EPG, a seven-day affair, is not transparent so blocks out the programme you're watching. It's hard to argue with the T2 HD's picture quality – both HD and SD channels look crisp and clear – but its basic interface and lack of add-on features means there are better value examples available. The T2 HD is easy to source online, but don't panic if you can't find it – a near-identical box is also available under as the Linsar FDH1 (on sale at John Lewis).